Annemarie Shrouder looked out over the sea of white, middle-aged male faces gathered at the convention of Ontario’s building and construction trade unions, and stated the obvious. 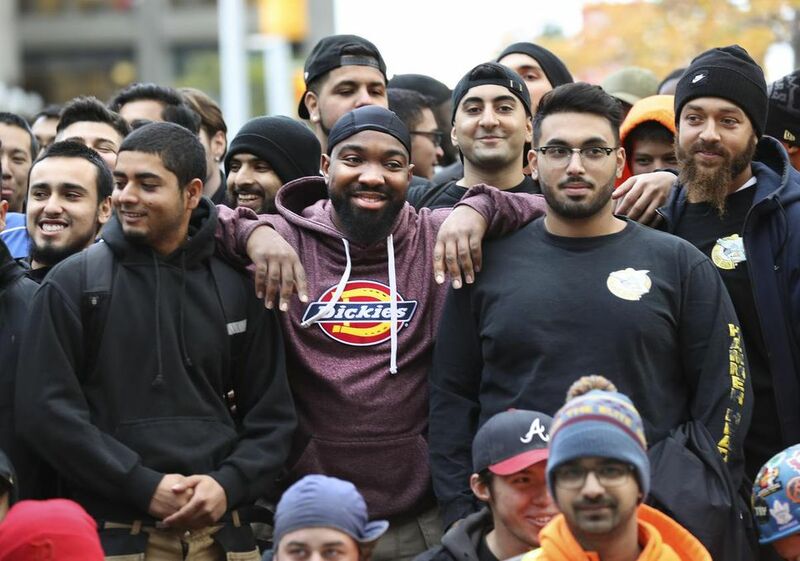 “I don’t see a lot of visible minorities or women,” the Toronto-based diversity and inclusion expert told almost 300 delegates and guests at the meeting in Niagara Falls this month. Shrouder’s keynote address comes at a time when a union-sponsored pre-apprenticeship program has come under scrutiny from both the City of Toronto and the province for allegations of abusive behaviour and racist language. Hammer Heads, which helps disadvantaged young people gain access to jobs in the construction trades, lost its contract with the city in July 2017 following complaints from participants about program director James St. John, according to internal city documents obtained through freedom of information legislation. After a ministry review, the province signed a new contract with the program this May, subject to Hammer Heads’ board of directors obtaining an independent review of its operations to be submitted to the government this week, according to an internal ministry memo. St. John is the head of the Central Ontario Building Trades Council, which represents more than 50,000 skilled trades people in the GTA from 21 unions, including electricians, plumbers and iron workers. His supporters praise him as a mentor who champions the underdog and uses harsh language and tough love to make sure young people living in poverty or in trouble with the law are equipped to survive the demands of the construction site. They note more than 420 young men and women have gained access to lucrative careers in the building trades since the program started almost a decade ago. But critics paint St. John as a bully whose racial slurs and verbally abusive behaviour demeans and humiliates young people in his training program, many of whom are Black. In addition to reviewing more than 100 pages of internal city documents about the complaints by Hammer Heads participants, two former program staff told the Star they were so upset by St. John’s behaviour towards the students that they quit to preserve their own mental health. “Everybody gets completely humiliated. It’s all about scare tactics, breaking them down so they are too afraid to move, to cough. It’s unbelievable,” said one former employee. “Even after they have graduated, they think he has the power to rip up their union cards if they don’t do what he says,” said another. Neither wanted their names published because they still work in the trades and fear reprisals. But some graduates praise the program. Justin Wedderburn, 29, a licensed tower crane operator who graduated in 2013 and attended a rally outside the Star last week in support of the program, was brought to tears when a reporter told him the city is no longer funding Hammer Heads. “It’s not right ,” he said. “I’ve got two kids. I can afford to buy a house right now … I was not thinking about any of that stuff before … But now I have conversations about finances and equity. That’s thanks to James. “It doesn’t matter how much you say he’s racist, the job site isn’t going to change. And they don’t like us,” Wedderburn said, pointing to his black skin. The allegations of mistreatment come at a time when the city, in partnership with the provincial and federal governments, is embarking on numerous “community benefit agreements” to ensure jobs that result from public infrastructure spending go to people in underemployed and economically disadvantaged communities. “These (pre-apprenticeship) programs are very important because we have to level the playing field,” said Patricia Wolcott, the city’s general manager of employment and social services. The building trades council started Hammer Heads in 2009 as a 12-week “boot camp” to help young men and women between the ages of 18 and 26 gain the social and professional skills to obtain a union apprenticeship in the construction trades. In addition to safety training and academic upgrading, classes of 15 to 20 students rotate through as many as 16 union training centres so participants can try out different trades. Students are not paid to participate, but the program covers all costs including safety gear and equipment. About 95 per cent of graduates find work in construction and receive at least a year of on-the-job support, according to Hammer Heads. St. John, who draws a salary from the council, assumed oversight of Hammer Heads in 2011. It achieved charitable status in 2013 and reported $1.13 million in revenue in 2016, with 67 per cent of funds coming from government and 33 per cent from other sources, according to the Canada Revenue Agency’s website. Expenses that year, the latest available, totalled almost $554,000. Through his spokesperson, St. John said he receives no extra financial compensation for the time he spends overseeing Hammer Heads. The program’s board of directors has three members who belong to unions represented by the GTA council. 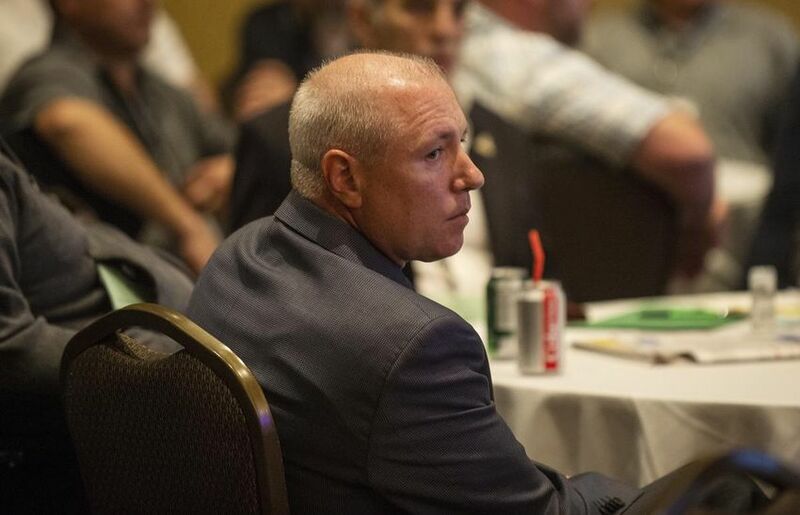 Board member Terry Snooks, international representative of the Canadian plumbers and steamfitters union, nominated St. John to head the provincial building trades council at the organization’s Niagara Falls convention. St. John lost the election to Patrick Dillon, who has led the Ontario council since 1997. 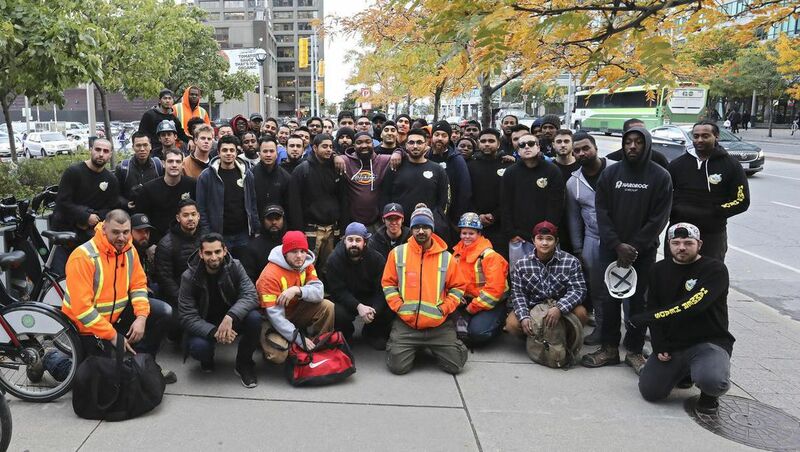 Although Hammer Heads is one of the more successful pre-apprenticeship programs in the Toronto area, the carpenters and labourers unions offer pre-employment training of their own, as do other organizations, said Wolcott. Construction Connections, created a year ago by the city, province and United Way, also provides links to the trades and offers support for disadvantaged youth hoping to find work on local transit expansion projects and community housing repairs, she added. Toronto social services staff began sending young men and women to Hammer Heads in 2009 and started funding program spaces in 2015 through a purchase-of-service agreement. The city paid about $12,000 per student and over three years spent more than $600,000 for 64 spots. Hammer Heads Facebook page boasts the program has saved taxpayers $3.8 million in social assistance payments and that about 85 per cent of graduates come from “non-traditional” populations. “Others talk diversity, we achieve it,” the August 2018 Facebook post says. Hammer Heads has strict performance expectations of all participants with a “zero tolerance” policy regarding attendance, punctuality and other requirements. For example, participants are kicked out if they do not arrive one hour before the program bus leaves for a training centre. Students are also removed if they haven’t completed their homework or other assignments, according to program materials. “If there was no Hammer Heads, we would be in the streets right now selling drugs,” said Matthew Lewis, 24, a sheet metal apprentice who graduated in 2017. “I am making more money than I have ever made in my life. They taught me the way,” added Lewis as fellow trades people chanted in the background. “It would be hurtful to me if this program was lost.” First year apprentices earn between $18 and $25 an hour, depending on the trade. Fully licensed trades people make about $60 an hour, including pension and benefits. After the rally, the program emailed a petition to the Star signed by 77 current and past Hammer Heads participants that said they experienced no abusive behaviour or racist language while in the program. “I will have James’s back until the day that I die because he changed my life,” said Nicholas Paris of the Hammer Heads director. 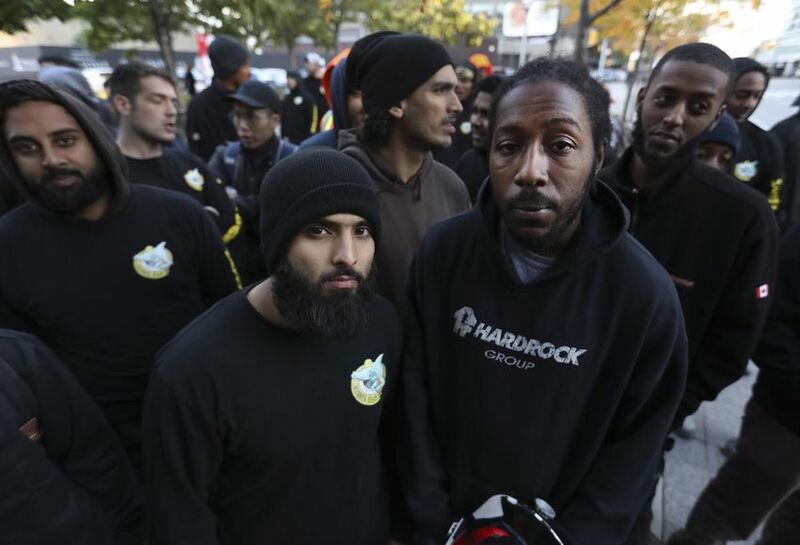 Haider Zaid, 27, an electrician apprentice who sports a three-inch beard, said he has never heard St. John tell students they look like terrorists or tell them they must shave their beards. Dillon, head of the Provincial Building and Constructions Trades Council of Ontario, which is separate from St. John’s council, said Hammer Heads enjoys a good reputation with his members. Although he said he was aware the city no longer funds the program due to St. John’s alleged “inappropriate behaviour,” Dillon said he did not know the details. He said he could not make any further comment until the provincially ordered review of the program is complete. A graduate from the early days who has almost completed his apprenticeship as a steamfitter told the Star he is “shocked” St. John is still running Hammer Heads. “It’s a great program and a great opportunity. And the people who run the day-to-day stuff are great. It is just him. He was such a negative influence,” said the apprentice who didn’t want his name published for fear of being punished by his union. St. John’s alleged behaviour was brought to the attention of senior managers in Toronto’s Employment and Social Services division in September 2016 by a welfare caseworker who said participants reported they are “constantly yelled at,” according to internal city documents. According to internal city emails, both the caseworker and program participants wanted to remain anonymous. “Clients often express frustration with the program in confidence,” the unnamed caseworker wrote in the note, one of over 100 pages of internal city documents about Hammer Heads obtained by the Star. “However, when advised that they can bring this matter forward, they are concerned that their placements will be taken away from them and do not wish to put in a complaint,” the caseworker added. Jessica Foster, manager of community and labour market for the city’s York Humber office, met with St. John on Oct. 25, 2016 to discuss the anonymous allegations. St. John also acknowledged the phrase about participants needing to shave because they look like a terrorist “sounded like something he might have said,” Foster reported in the documents. When Foster reportedly questioned St. John about Hammer Heads’ own “Program Participant Contract” and “Discrimination/Harassment Policy” that states the program will “maintain an environment that is free from harassment, intimidation, etc.,” he said he “chooses his words carefully and that the phrases he uses are intended to push their buttons,” Foster said in her notes obtained by the Star. “Youth need to be able to work through what they will be exposed to,” St. John reportedly told Foster. He said the program is giving youth “the tools they need to succeed on the job,” Foster added in her notes. St. John told Foster “yelling is a component of the program” and that he pushes their buttons “so youth can work through their challenges,” the documents say. Subsequent briefing notes later that fall suggest St. John didn’t seem to understand the city’s concern about his behaviour towards participants. According to Foster’s Nov. 8, 2016 briefing note, St. John said he would take the city’s perspective “under advisement” and “try to be more diplomatic,” but remained resolute that his tactics are the reason his program is so successful. He wasn’t sure what this would mean to the program’s future with the city, but suggested the city, and not the program, need to change, according to the briefing notes. As a result, Foster and Irwin Stanley, director of the city’s west district employment and social services office, met with St. John again on Nov. 15, 2016 to ensure he understood city anti-discrimination and anti-harassment policies. But the behaviour didn’t appear to stop, according to notes from city staff who spoke to a different set of Hammer Heads participants in April 2017. “One very vocal student said that James used the word “n-----” many times,” city caseworker Irene Osterreicher wrote in an April 18, 2017 email to Jessica Foster. St. John reportedly advised the students: “ ‘You are going to be called n-----, you are going to take it and not say anything,’ ” Osterreicher said in the email. “The student also said that James told the group not to even consider going to ‘human resources’ …because they wouldn’t do anything,” Osterreicher added. “It does sound like a bunch of complaining — and perhaps some youth who just can’t take the strictness of it all,” Osterreicher continued. “But when all of the candidates express these concerns, it causes me some concern. I’ve heard these same complaints from other Hammer Heads leads, as you know,” she said in the email, referring to other municipal staff who have overseen the city’s involvement in the program. An April 11, 2017 client satisfaction survey of 13 participants who began Hammer Heads in January of that year, showed the program successfully placed participants in coveted trades apprenticeships. But seven of the responses also reflected concerns about the methods used to achieve those results, suggesting the ends may not justify the means. “We were sworn at every day, even on our last one,” wrote another participant. Using the washroom or taking a second bottle of water on a hot day were enough to trigger verbal abuse from St. John, the participant added. “With these people in charge, I would never recommend this program to any of my friends … I hope you can make a change in this area and keep the program running with better suited people,” the participant wrote in the survey. As a result of the second set of complaints, internal documents show city staff had heard enough. On May 16, 2017, city staff notified Hammer Heads it would not be sending any more clients to the program, according to another internal briefing note. “Clients were to be advised of alternative training options in the apprenticeship and trades sectors,” the briefing note said. Internal documents show city staff notified St. John and Hammer Heads’ board of directors about the nature of client feedback in a letter July 7, 2017, confirming the city’s reasons for ending its funding. “We are deeply concerned and disappointed by these issues and regret that we cannot continue to refer our clients to a program that does not meet city standards,” said the letter signed by Stanley, director of the city’s employment and social services west district. “I take great offence to being accused of something that we haven’t done and will have to take action to defend the honour and the integrity of our program,” he said, adding he graduated 86 participants since his November 2016 meeting with Stanley — and all of them would defend the program, according to the documents. Two weeks later, on July 24, 2017, St. John sent Wolcott another email in which he continued to express outrage at the city’s action. “My concern is with the disparaging remarks that have been made from the city staff about our program,” he wrote. “We are seeking a full retraction and apology before this matter gets worse and we need to seek damages … I am confident in my information; I hope you are equally as confident in yours,” he added. St. John, whose wife is African Canadian, “uses his background to educate about stereotypes that prevail,” Raj Rasalingam wrote in an email to the Star last week. Allegations that St. John yells at students “to push buttons” and to “break” them so they will learn to stay silent on construction sites are also “not true,” Rasalingam said. “Real life examples are used to train students,” he said. “The fact is, the city had not developed specific guidelines that surround their training programs with respect to real life situations. On May 8, the ministry signed a $187,712 transfer payment agreement with Hammer Heads to provide pre-apprenticeship training for 2018-19. Under the deal, the Hammer Heads board is “required” to submit its third-party report to the ministry by Oct. 24, according to the internal documents. Meantime, Dillon, the newly re-elected head of the provincial buildings trades council, says the trades are taking Shrouder’s message of diversity and inclusion to heart.